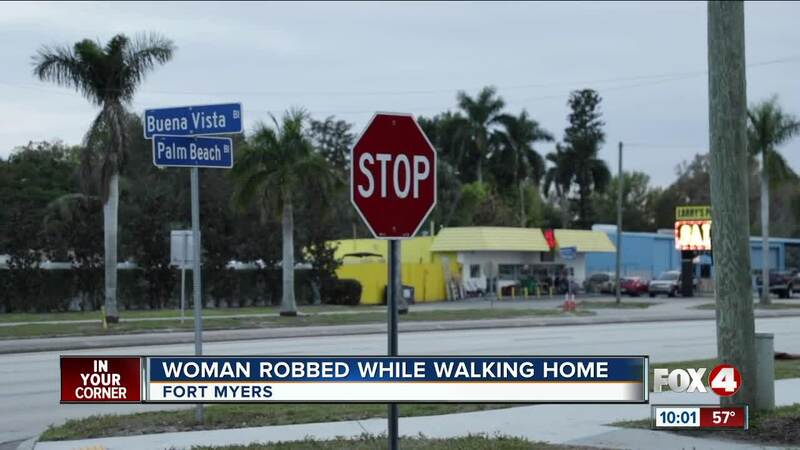 FORT MYERS, Fla. — A woman was attacked while walking home from the grocery store on Monday morning off Palm Beach Boulevard in Fort Myers. Erika Jaimes usually walks to Maxx Foods, a grocery store only a few blocks away. On Monday, a man followed her from the store back to her neighborhood on Buena Vista Boulevard, when he got out of his car and approached her. “They started like fighting for it because my mom said no, she wouldn’t let go,” her daughter Miriam Fajardo, said. The man punched her in the face, causing Jaimes to fall to the ground. “Then he started kicking her in the knees and stuff so she would let go,” Fajardo said. The man ripped the purse out of Jaimes’ hands and fled with her cash, cellphone, and social security cards. Her neighbor Martin Francisco heard Jaimes yelling and rushed outside. “He heard a lady screaming, yelling for help,” said Janeth Bartolo, Francisco’s daughter. Both families say they are hesitant to walk in their neighborhood. “We feel afraid to go now,” Bartolo said. Lee County Sheriff’s Office said this is an active investigation and is still looking for the suspect.